Last night, The Husband and I sat together in our respective recliners (don't laugh, well, okay, go right ahead) in our family room with the fireplace going and the white lights on the Christmas tree blinking and twinkling to watch the premiere of The Sing-Off (don't laugh, well, okay, go right ahead) on the DVR. Which by the way, was really, really good. I highly recommend giving it a chance. Plus there's cutie patootie Nick Lachey hosting. Scott may never confess his undying love for Acapella music, but he sat there and watched it with me. So there's that. Sometime much later, possibly in the wee hours of the morning, I woke up a few times feeling rather cold, well, at least my nose was, as the rest of me was tucked under a few layers of bedding topped off by a toasty duvet. I worried maybe our pilot light had gone out or our heater was on the fritz, but I did nothing further to investigate because, after all, most of me was warm and cozy. Once Scott got up this morning he did investigate because he was about to be the one getting ready for work in an icy cold bathroom any moment. Someone, who shall remain nameless, but she might be the author of this blog, had turned the heater off at some point yesterday. Completely off, OFF. See, Scott and I have very different internal heaters, typically he runs cold and I run on the warm (HOT) side. I love cooler weather because I actually feel normal for a while. I like for the house to be cool and snuggle up under layers and blankets. Scott is the opposite. I have been known to be passive aggressive sneaky with the thermostat, taking it a little too far yesterday when I turned the system OFF and promptly forgot about it. We were in the mid 30s last night outside and the temperature in the house had gotten down to 60 when Scott checked it. Then I started thinking about how easy we have it, only needing to push a button and our comfort is soon restored. Others don't always have that easy solution. Yesterday we also had unexpected repairs completed on our second car. We were a little grumbly about it at first, the timing of an expensive bill at Christmas and all, but were thankful to have it done. I thought about how nice it is to have a second car and how I don't always think about that until we are without one. I'm so thankful for all of the essentials and comforts that surround me. But I know I take it all for granted most of the time. With Christmas fast approaching I'm feeling a strong urge to practice more giving, more service. Yet I'm not quite sure where to start. 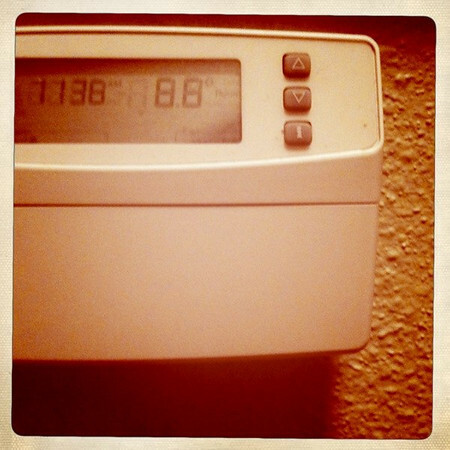 Do you and your spouse agree on the thermostat or do you resort to my sneaky methods too? How do you balance the buy-buy, want-want with giving and service? I'd really appreciate your ideas and suggestions! This is VERY timely! I just decided to forgo my Starbucks run at work to save money to donate! I've decided that I'll quit my Starbucks treats for the next few months and use that money to donate to Kate's Crazy Cool Christmas. She is an almost 7 yr. old batteling cancer. Her story is on caringbridge.org/visit/mcraekate/journal. She started a Christmas gift drive to help other sick kids with cancer. I do what you do with the heater. Kim likes it on 72 which makes me feel like I am frying. I like it around 66 or so. I think we are experiencing the same weather you are. I was pleasantly suprised by the Sing Off. I don't usually like shows like that but have already ordered Kim to DVR Wednesday's show since I will be at book club. We adopt a needy family through church for Christmas but so far that's it. I think it's important to involve our Children in acts like that during the holidays. That sounds like something I might do except that I'm usually pretty good about checking it before I go to bed because I know how quickly it drops and how frosty 60 degrees feels inside the house! We usually keep it at 69 through the winter. We didn't record The Sing Off. My TV watching has gone way down since I started working and become such a sleep Nazi. Now we have time for 1 show and then I'm off to bed. I feel like the Christmas season is a constant time of feeling the desire to buy, then feeling pangs of want, then swells of gratitude, then a mindset of simplicity and then back again. OH NO!!! I forgot to record the sing off!!! the girls are going to be so dissapointed... shoot! I like Val's idea above- how sweet to give up her starbucks! that's not easy to do!!? It's such a hard balance this time of year- I start feeling overwhelmed & scrouge-ish... that's not Christ like either. Have not watched the Sing Off, but will try to catch it next week. Husband has minimal tolerance for singing shows though. We both like a cool house. We are overly indulgent in the summer with the A/C and stingy with the heat in the winter. I like blankets. Not sure about ideas for balance. It is a challenge. We do the Angel Tree and I do little things here and there, but definitely need more focus. We had a $1500 mechanic bill last week..ouch. We didn't expect that at all. I joked that Mike bought me new brakes and injection coils for my birthday but I was really grateful, too. We're blessed to have cars that run, period. GAH! My son max ACTUALLY SWITCHED THE HEATER TO THE A.C. earlier this week. I was freezing my arse off, finally checked the thermostat, and saw that he'd switched it over to air conditioning. We do a fun "12 Days of Christmas," a la doorbell-ditch style. Some years the goodies we drop off on the doorstep are nicer than, say....THIS YEAR. This year we are doing it easy & cheap, but it's still fun to be the recipient. I also emphasize the siblings giving to one another, and to their teachers. I know--these are not dramatic, grand gestures; but i think small acts of thoughtfulness get the message across. maybe even better, when you're trying to teach a child. If the act of service is something THEY CAN DO THEMSELVES, they feel ownership of it.